Some of the biggest, most intractable challenges confronting humanity – chronic disease, climate change, excessive household and public debt – stem from human behaviors such as poor diet and exercise, unsustainable energy use and excessive consumption. Incentives to act rationally are all around us – from legal restrictions to the ways in which companies price goods and motivate workers. The vast majority of these enticements and impositions assume that people are utility-maximizing rational agents who act in their best interests. Except, as behavioral economics (BE) demonstrates, we aren’t. Increasingly urgent behavioral challenges. As the cost of issues such as chronic disease and climate change rises with aging demographics and globalization, the imperative to address them becomes increasingly urgent for governments. The economic opportunity is also attracting the private sector. The march of technology. 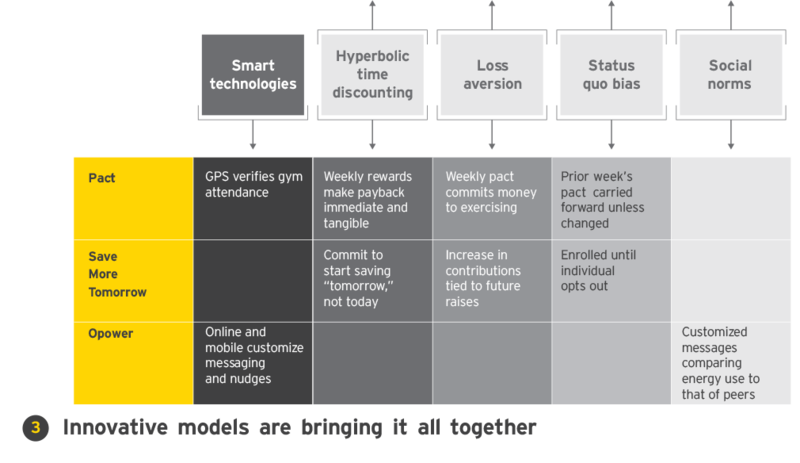 The digital revolution is catalyzing the deployment of behavioral economics via smartphones, sensors and social media. The power of behavior economics can already be seen in a number of sectors. In health care and wellness, startups such as Pact and stickK are helping people improve diet and exercise. Opower helps utility companies nudge consumer behavior by applying the motivating power of social norms. And firms implementing behavioral economics approaches have significantly boosted employees’ retirement savings. Businesses and governments will have to overcome challenges as behavioral economic approaches are more widely adopted. It is critical that incentives be designed to preserve individual freedom, even as they nudge (not force) people toward better choices. A second challenge is that chronic disease and climate change will play out over decades, requiring long-term behavioral change. Behavioral economists don’t yet know enough about whether nudges that work in the short term will lose their impact over time.